You are here: Home / Sandwiches, Wraps, Etc. / Turkey, turkey, turkey, turkey–what can I do with all the leftovers? What can we do to avoid this waste and keep our families more delighted with our dishes? If you end up with tons of turkey after your feast, consider freezing it so you have more than 4 days to enjoy it. 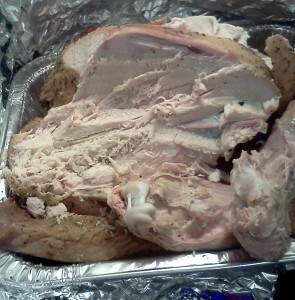 To freeze your turkey, remove it from the bones and store in freezer safe, airtight containers. Consider slicing and dicing it before storing so it is ready for your favorite recipes when you need to thaw some. Be sure to label it clearly with the date and contents. These can be exceptionally useful to add to soups, salads, casseroles, or anything else when you want to add a little more flavor.